I want to display my custom flags images at the language switcher module. How can I replace the default flags of the module? We can define which image should be used for each language, when creating/editing the Content Languages in Language Manager, through the Image Prefix selection. That the Flags images should be in .gif format and uploaded in the mentioned directory. 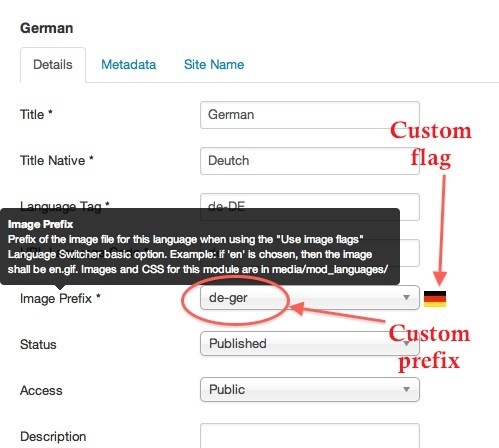 There is no need to replace existing images as we can use any prefix we like for our flags. The custom flags would be available in the Edit Content Language layout, and we can search for them by typing the prefix we gave them. Not the answer you're looking for? Browse other questions tagged overrides module-display multilingual language or ask your own question.